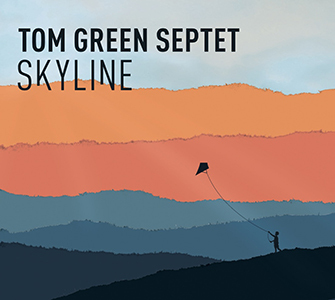 THE GRACEFULNESS of the cover art speaks volumes about the creative balance that shines out from Skyline, the debut septet recording from Cambridge-born trombonist Tom Green – a collection of expansive new compositions coloured by ever-changing hues, light and shade, allowing each of his players considerable freedom in improvisation. The robust four-horn line-up of Green, Sam Miles (tenor), James Davison (trumpet/flugelhorn) and Matthew Herd (alto/soprano) offers impressive big band dynamism and breadth, yet also a supple luminosity which breathes life into the trombonist’s seven originals, plus one arrangement of a much-loved standard. Still in his 20s, Tom Green’s credentials are indubitable – the Royal Academy’s first postgraduate trombonist, winner of the 2013 Dankworth Composition Prize (leading Dame Cleo to declare his work as “some of the most exciting original new music I have heard for a long time”) as well as a 2014 Help Musicians UK ‘Emerging Excellence’ award winner. And his mercurial brass dexterity is a delight, ranging from blistering riffs to svelte tonal lyricism. Initial impressions are of crisp arrangements and sharp execution, typified by the opener, Sticks and Stones. It’s brisk and propulsive, with layers of textures and ideas over which Green and James Davison solo brightly; and gear changes throughout this album (such as the brief trombone and piano contrapuntalism here) add greatly to a sense of variety, not unlike the fluctuations of light on a plain caused by fast-moving cumulonimbus. The dilatory drawl of a Deep South-suggested horn preamble to thirteen-minute Equilibrium opens into an addictive bossa of moody twists and turns, bejewelled with Sam James’ precise piano expression – and then, all at once, it gleams to lush arrangements and, also, cacophonous scribbles which Green glides through with proverbial swan-like ease. Arctic Sun swings delicately to the rhythm of bassist Mullov-Abbado and drummer Chapman, building towards elaborate, soaring soprano from Matthew Herd (a saxman who always displays a real penchant for pushing the envelope). There are shades of contemporary pop ballad in the memorable phrases of Peace of Mind, Green fluent in his extemporisations; and easy-going Mirage prompts fine soloing amongst the exacting full horn scoring. Hoagy Carmichael’s perennial favourite, Skylark, is both chirpy and breezy in Green’s hands, though perhaps loses a little of the charm of mellower renditions; and Winter Halo might easily conjure luminescent landscapes and vacillating murmurations (startling rapidity of soprano bird calls from Herd! ), including another of those delectable duo interludes – Sam Miles’ rich tenor against pellucid bass. DIY is an irresistible closer, pictorialising the brash, processional jazz of New Orleans and encouraging overlapping showy solos from all quarters, as well as more examples of the leader’s flair for snappy, complex arrangements (no doubt a crowd pleaser on their recent launch tour). As a jazz release, this displays so many hallmarks of a classic, seasoned ensemble. As an ambitious debut from a young, close-knit septet, it’s a striking first statement with great potential for future development. And, above all… such an upbeat listen! Released on 2 February 2015, Skyline can be purchased directly from Spark or Tom Green’s website.